Dominion is a logic puzzle. 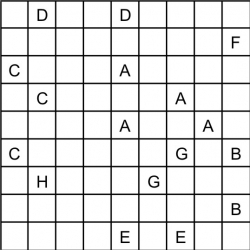 It consists of a grid, with letters in some cells. - The black cells must form dominoes which can touch each other diagonally. - Cells with letters are always white. - The black cells divide the grid into regions of white cells. - Cells with the same letter belong to the same white region. - White regions without a cell with a letter are not allowed.